After a vivid ride through London on the back of Kevin’s motorbike (a big BMW, as used by the Met, for all you bike fans) we turn up at Bush Hall to see Dylan sidemen from different eras making a joyous noise – two performers who really love playing together, picking songs that they’ve probably played forever. Yes, there are plenty of phenomenal guitarists out there, but often they’re players whose virtuosity is almost a barrier to connection. That’s not the case here. This was a conversation between erudite practitioners who transmuted the pleasure they find in playing into the audience’s unalloyed enjoyment. Towering over all the risqué blues songs (Bromberg’s speciality) and the transposed Irish and Texan fiddle tunes (Larry’s bag) is a performance of “Delia” that is just hypnotic. For ten minutes, Bromberg sings and recounts the origins of the song against honeyed and stately tick-tock fingerpicking, while Campbell embellishes the tune with a swooping, swooning accompaniment on the bottleneck, finding beautiful, piercing melodies for as long as the song takes to wend its way to the last sigh. And every verse ends with the sad and resigned statement above, sing/spoken in the most poignant fashion. I’d a been happy if it had lasted twice as long. Alternately fascinating and grim (with actors playing Karen, Richard and their parents) as only programmes called Autopsy can be, this peculiarly tragic episode piled up the evidence for a recovery from anorexia, only for her to be failed by a pitifully weakened heart. My friend Andrew and I saw the Carpenters play a midnight show at the London Palladium in 1976 (yes, ’76, the year of Punk). It was in aid of Capital Radio’s Help a London Child, and you had to queue at Capital’s HQ at Euston Tower at seven in the morning. With a soft toy. So we did. The show was great – Richard’s dreadful vaudeville numbers, Karen’s drum solo and all. Tony Pelusi ripped out the classic guitar solo on “Goodbye to Love”, and Karen sang like she always did, trying to keep that melancholy tear at the edge of her voice at bay. And sets off a string of memories: I first saw The Proclaimers, as did most of Britain, when they appeared on The Tube. Our band was on that Friday, too, along with the Psychedelic Furs. We had travelled up to Newcastle, where the studios of Tyne Tees were, on the Quayside, and my day had already been made by the sight of Bobby Charlton being signed in at Reception. I remember two things well from the show. One was talking to Mars Williams, sax player for the Furs, and interesting to me as he had been a member of The Waitresses. They were a band I loved, for its mixture of Patty Donahue’s knowing sarcasm and the NY new wave of Chris Butler’s songs (songs with titles like “They’re All Out Of Liquor, Let’s Find Another Party” and “I Could Rule the World If I Could Only Get the Parts”). I tended to buy anything that I could find on their label, Ze Records. Among their bizarre acts (Mutant Disco became the quick catch-all for what their releases sounded like) was an early version of Lana Del Ray who went by the name of Cristina (”Is That All There Is?” is still a masterpiece) and the stunning Material (including Bill Laswell and Fred Maher) whose “Busting Out”, with Nona Hendryx singing, you really need to hear. This a nice piece about The Waitresses… I Know what Girls like: The Waitresses and the limits of the “Female-Fronted Band by Lindsay Zoladz on Pitchfork. Richard Williams writes so well about this exhibition (and the use of The Band’s “The Weight” here) that I’m not sure that I can add anything much. Oh, except that my problem with exhibitions of photography are often about sizing. 400 10×8 prints is a lot to look at, and there’s too much here that is run-of-the-mill. The good ones deserve better printing to bring out the shadow detail, and sometimes more scale would be a good thing: Double Standard works well as a huge poster at the entrance, but its charms are lessened as a 10×8, where it looks a poor cousin to a Friedlander, Winogrand or Frank shot (above: the blow up/an introductory caption/watching a loop of Easy Rider from the balcony.) 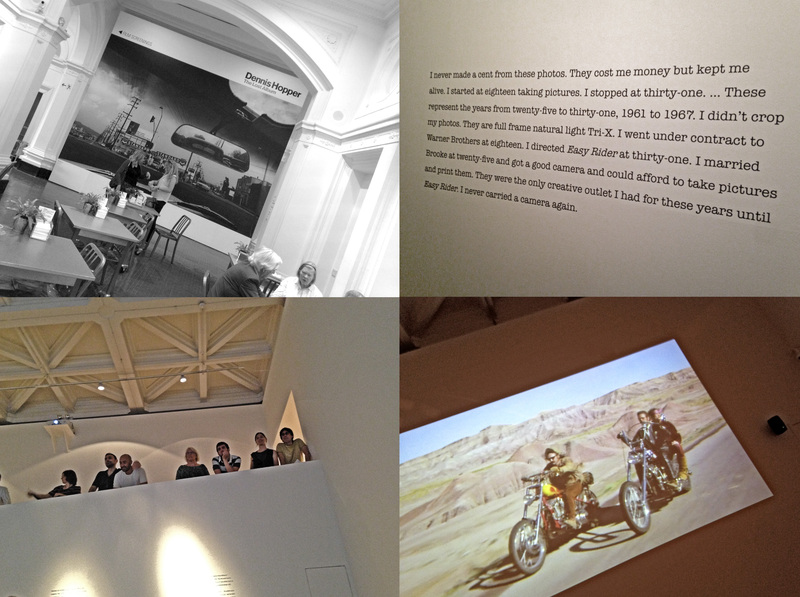 By the cafe is a small temporary screening room where Easy Rider and The Last Movie are shown a couple of times a day. I caught the last thirty minutes of Easy Rider, which looks pretty dated but is carried by its fervour – it feels like something that Fonda and Hopper needed to make, and not a studio product. I remembered that a cover version of “The Weight” was used on the soundtrack album, but had forgotten that “It’s Alright, Ma” – a song that eloquently addresses some of the film’s concerns – is used at the end. Sadly it’s a woefully lackluster version by Roger McGuinn, and just proves that it’s one of those Bob songs that should never be covered. 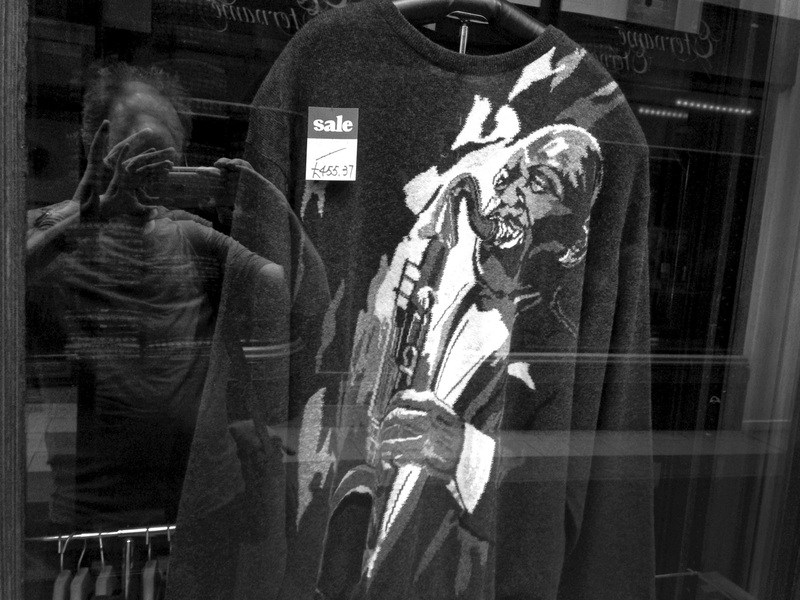 Upon leaving the Royal Academy, this “Jazz” sweater caught my eye in Burlington Arcade. The word we’re looking for is “why”. Thanks for the review of Dave Bromberg and Larry Campbell. We were lucky enough to see them last week at the Victory Hall a lovely little village theatre in Thorner Yorkshire. Absolutely terrific show from beginning to end. Their first in the UK as a duo. The version of Delia was a particular highlight, and the story surrounding it. For further reading on this I can recommend the Sean Wilentz book “Bob Dylan in America”. “Cristina” was Christina Monet, wife of the label’s owner Michael Zilka. I have her first LP in the attic I thought I had a Ze compilation with a dynamite Material track and an odd one by Alan Vega, but it seems that was on Celluloid, which was an associated label. Oh well.